I saw that Zooey Deschanel was on the cover so I bought an issue. 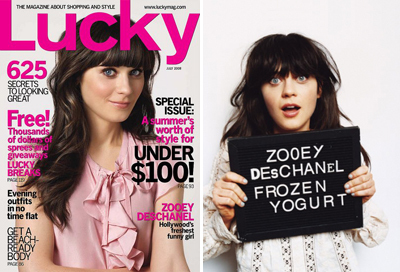 I am a big Zooey fan. I even like her band She and Him. So I thought "Cool! Pictures of Zooey's house." Um, no it was only one room. So I was miffed. I mumbled about it for a few days. Then I heard Domino was closing. And now I feel bad. I love her as an actor !! she is so quirky and cool. Uncanny.. I was just listening to her band and I really like it. It seems like that voice shouldn't be coming out of her. 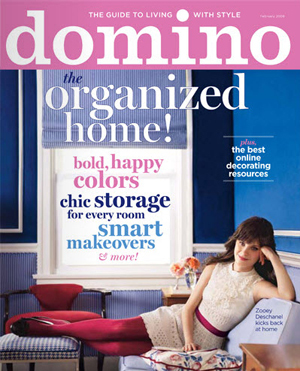 I am totally bummed about the Domino thing. That is one of my favorite mags. My favorite magazine (Wish) stopped publishing as well. So so sad. She is so cute..she reminds me SO much of Xena the warrior princess. I love to hear her sing too - the one verse of "Baby it's Cold Outside" she sang with Will Ferrell in "Elf" is my favorite version of that song. It's a shame about Domino - I liked that one. Awww....that's so sad. First Blueprint and now this? At least Zooey will be around. She was awesome in Weeds. I very recently received as "Please Subscribe" packet from Domino and had put it in my stack to look at further. And now they are closing?